relentless. Thanks to its constant buzzing about, White obtains a draw. The rook should be kept flexible and active at all times. 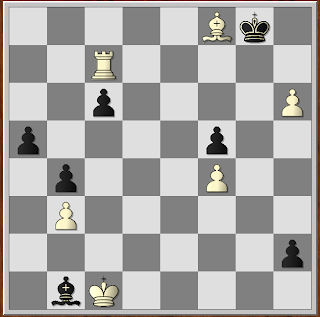 Black Moves In this position Black is two Pawns ahead, and it is probable that he can win with proper defense. However he fails to understand the position. He should strive to keep the lines closed, for instance by Playing f6 and retreating the Knight to g6 ( after White's inevitable f4) so as to observe the key square, White's e5. White must be prevented at all costs from opening lines by f4 and e5, instead, with his next move, Black,solves the problem. 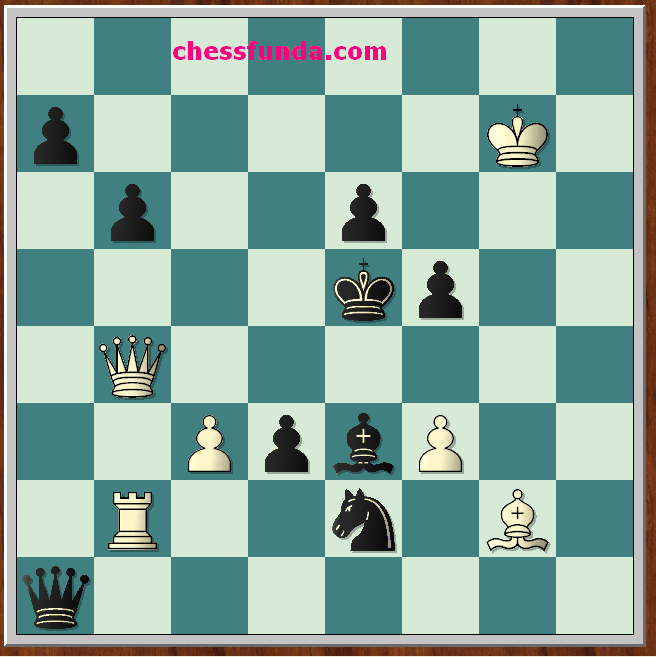 Morphy has thus far been unable to solve - namely, how to open up diagonals for his two Bishops. The twentieth-century neo-romantics, notably Tchigorin, Marshall and Spielmann, carried Morphy's lessons of the open game to the point of absurdity when they attempted to render Force completely subservient to aesthetics. Marshall, in particular, lacked the ability to discriminate between the beautiful and the possible , often over-reaching himself. The Romantics, in general, suffered from an inability to discipline their imaginations. The Romantic style wa characteristic of the man loving action and quick success. The classical reaction was due principally to the character of one who disinterested in the glory of ready success. Who strove instead for lasting values -- Wilhelm Steinitz. Dear Readers if youhave liked the article kindly Dig it, Stumble it, add to technorati etc. and write some comments because your comments are valuable assets for us. positional styles once again held the highest chess titles. The world of chess was dominated by the likes of Tigran Petrosian, with his motto of 'safety First". Boris Spassky, who had an aggressive, universal style; and Bobby Fischer, who had a very clear, simple, classic style. In 1975, Anatoly Karpov won the title by default from Fischer. Thereafter, Karpov set out to prove that he deserved to be World Champion. With his refined, dry style and relentless precision, he crushed everyone in sight. People dreamed of a Tal-like player who would rise up and brighten the chess world with tactical fantasy. The dream became reality when Garry Kasparov won the title from Karpov in 1985 at just 22 years of age! Born in Baku, Azerbaijan, Kasparov is considered by many to be a reincarnation of Alexander Alekhine. a master of all openings, Kasporav slices and dices his opponents with a combinative vision that is every bit the equal of Tal's and Alekhine's. the excitement of Kasparov's style has revitalized interest in chess. attack. Moreover, White is far behind in development. The cureious move, which seems to take a vital piece out of play, is in reality the only defense. 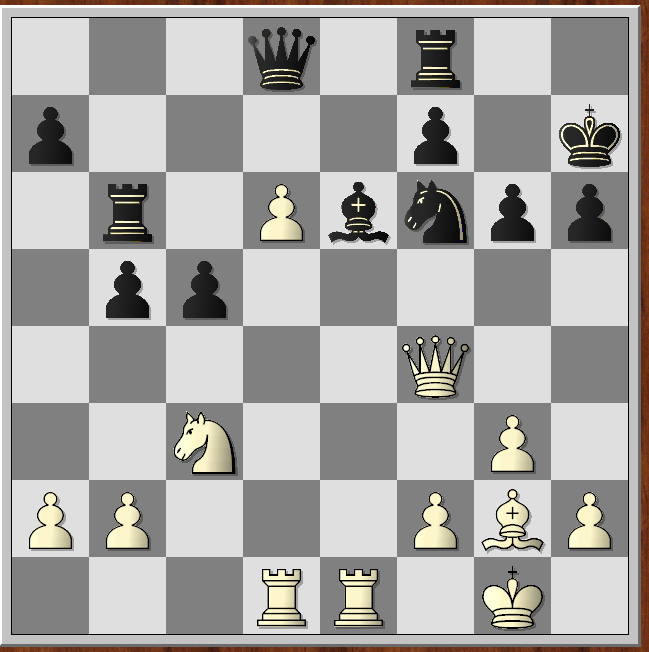 It prepares 2 d3, bolstering the e4 and releasing the Queen-Bishop. 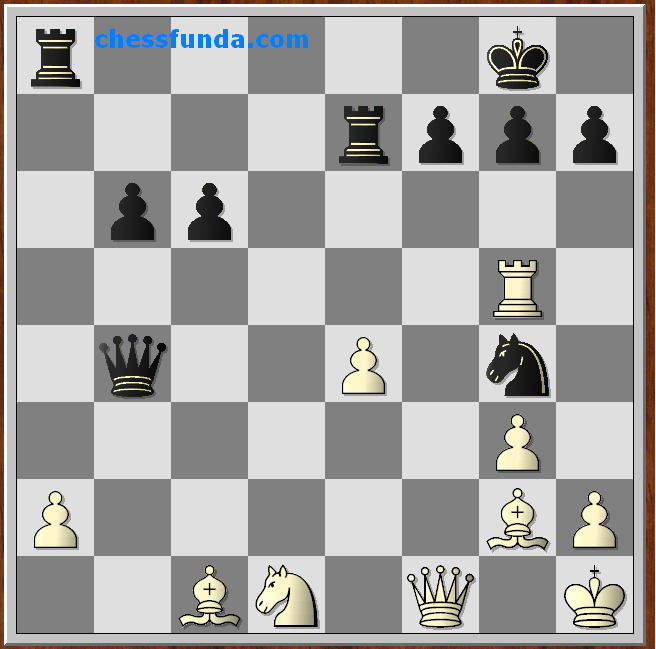 Also, the Knight can later return into play with c3, gaining a tempo by the attack on the Queen. The point of Black's little combination. the retreat of the Knight to c3 would be pointless. This is the refutation . Ofcourse not 4 Knight x Knight? White was able to withstand the ensuing attack, and eventually he reached the endgame where his material advantage proved decisive. Morphy was the first player who fully realized the importnce of development. He expressed this in the simple phrase, "Help your pieces so that they can help you." He was often aided by the unnecessarily timid defensive moves of his opponents, or even by their unnecessarily aggressive moves as we have seen. This concept is so highly theoretical that it is comforting to find an example in practical play - even if one does happen to be on the wrong end of it! Black has just played h6, "Putting the question" to the Bishop, White's reply comes as a rude shock! This move gives White his piece Back without a fight. However, there is no way to kep the extra piece. Dear readers If you have alternatives contribute through comments. Your comments are the most valuable assets for us. Wilhelm Steinitz and the Classicists : Closed Game. essences. He sought all his life for generl laws and loathed exceptions. When he finally revolted against Romantic doctrines, the break was sharp and irrevocable. closed position is characterized by barricaded pawn structures and is thus more amenable to systematic approach. winning combination. In an age where plyaing to win from the very start was considered the only honorable course, such a doctrine was assured of a sornful reception. Not surprisingly, all his victories were in fact begrudged. In 1866 Steinitz wrested the world title from Anderssen, who promptly conceded that Steinitz was even better than Morphy. yet so bitter was the enmity against Steinitz's style of play that even after he had held the world championship for twenty years, a self appointed committee of three amateurs claimed that "Morphy could have given Stenitz Pawn and move." And a noted critic once wrote that Stenitz's two match victories over Zukertort were attributable to the fact that "Zukertort was not yet Zukertort in 1872 and was no longer Zukertort in 1886". Steinitz held the world title from 1866 until 1894. During this period he was so anxious to vanquish those who scorned his "system" that his style became provocative. Stenitz often invited premature attacks. 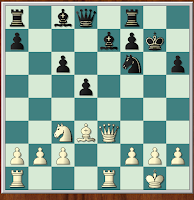 He made the most unusual moves in order to provoke his adversaries into playing for a win and thus overreaching themselves when the position did not really justify such an attempt. Quite characteristically, steinitz once wrote, "A win by an unsound combination, however showy, fills me with artistic horror." A winning combination, he was the first to perceive, is possible only after one side has erred. Make no errors, therefore, and one should never lose! Pin It Black's weakest square on the board before castling is f7 (f2 for White). Even in the opening stages, threats of a sacrificial asault on f7 (orf2) are common. 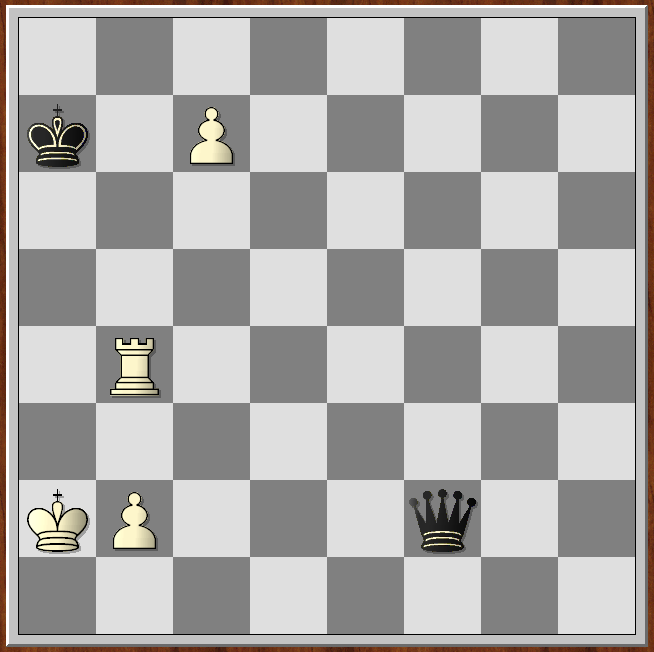 ; they are usually connected with an attck on the king or even with the idea of mate, in which case the square becomes the focal-point of a mating attack. 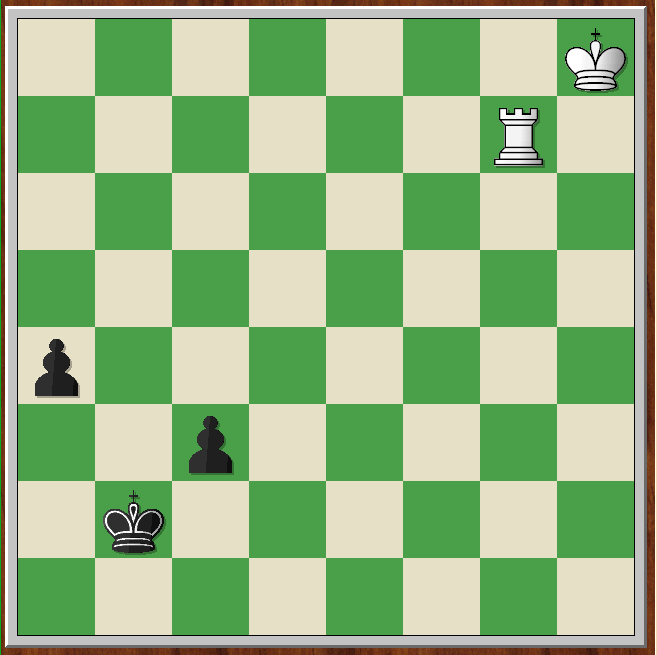 Later on, after castling kingside, the rook protects this vulnerable sqaure and its weakness is greaty diminished, while after sactling queenside the weakness of the square has no connection with a mating attack. The straight forward examples of assaults on f7 are to be seen at the beginning of certain open games, especially in the Petroff Defence, and the Philidor defence. We shall examine one example of this kind. 1 e4 e5 2 Nf3 d6 3 Bc4 Ne7? Let us allow Black to play this bad move so as to reach a typical crisis over the square f7 as quickly as possible. After 6 ---Be6 7 Nxe6 fxe6 8 Qh5+ Black loses a pawn and the right to castle. and Black loses at least a pawn. 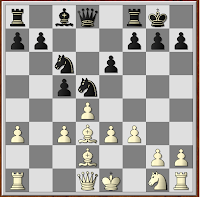 If 7 ---f5 8 Bxb7 e4 9 Qb3 Qxg2 10 Rf1 and white wins. 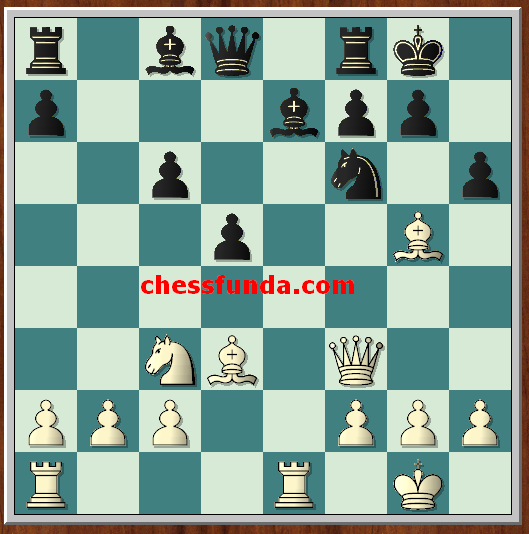 Naturally, Various attacks can be made on the uncastled king othe than via the e-file or f7, these are only two of the commonest and most typical methods. 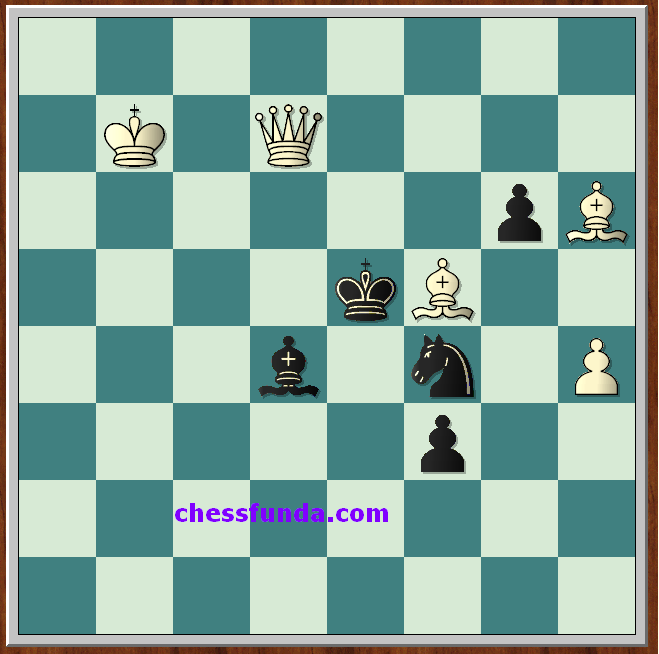 the mating focal-point is that from which an opponent's piece ( other than King, Knight or Pawn) mates the king at close quarters. To carry a mating attack successfully it is always useful to survey the posible mating patterns, to prepare a mating net accordingly, and to concentrate on the focal-point, that is to deprive any opposing pieces of their control over a square which woud be convenient as a focal-point. White to move, observes correctly that the square d4 is a potential focal-point and that his queen could mate from there, if it were not for its being controlled by Balck's Knight and Bishop. So he clears the focal point d4 as follows. Many readers will object that the patterns of mating attack shown here are so obvious, indeed banal, that they need not even have been mentioned. However, I think it is useful to strengthen just this simple kind of knowledge, since in fact there are many mistakes made precisely in this field. Here are a few instances of mistakes concerning mating patterns. 1) The attacker fials to peceive that he can neigher stop his opponent from moving his king nor drive him into a mating net, but still plays for mate. Such a course of action is naturally futiele, and though it may possibly produce perpectual check, it cannot produce mate. 2) The attacker plays on the basis of typical mating patterns, ovelooking the posibility of an 'atypical' one in a particular continuation. 3) The player sees all the possible mating patterns based on one focal-point, but fails to realize that all this is cancelled out when the king moves, and that what matters then are new mating patterns, for which he has not made preparations. 4) The player decides on a course of action based on a certain focal-point, without realizing that he cannot provide cover for it or even clear it of the influence of his opponent's pieces. Mistakes made in the selection of a focal-point will be found even in the games of the masters. 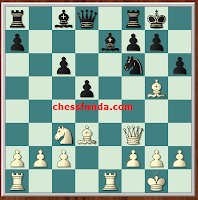 So it is useful to get to know the general pattern and structure of mating; less experienced players are especially recommended to study games to see whether a player had amde a mistake with regard to the pattern and, if so, where he has made it. Readers comments are the most valuable assets for us. failed to castle at the right time. 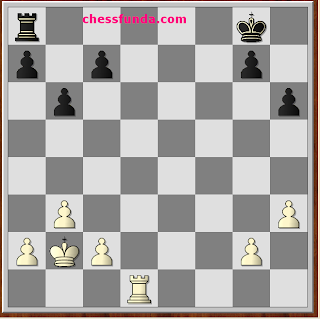 The initail position of the king before it castles contains two main weaknesses. One is that it is exposed if the e-file is opened up, the second is that the square f7 in Black's position is vulnerable (f2 in White's position)since it is covered by the king alone. It is therefore natural that the vast majority of attacks on an uncastled king exploit one of these weaknesses. 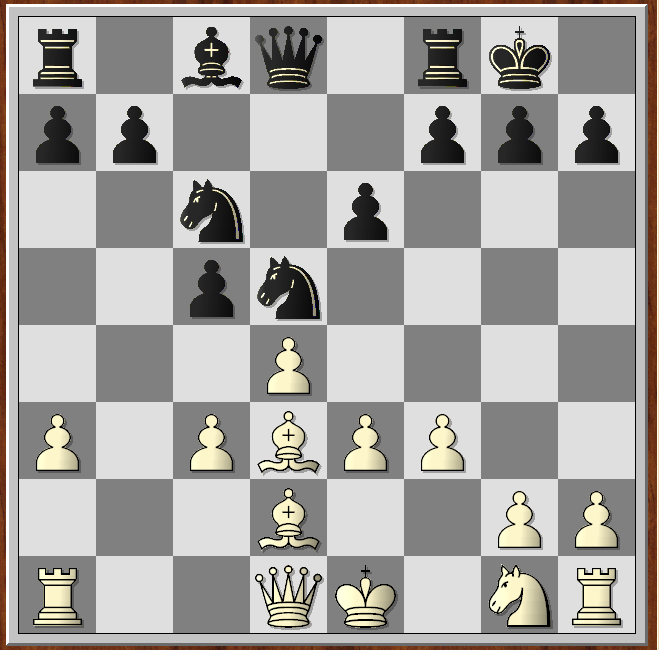 The first and most fundamental condition for an attack along the e-file is that the opponent's king should be on that file, and that for some reason it is impossible or difficult for it to move away. 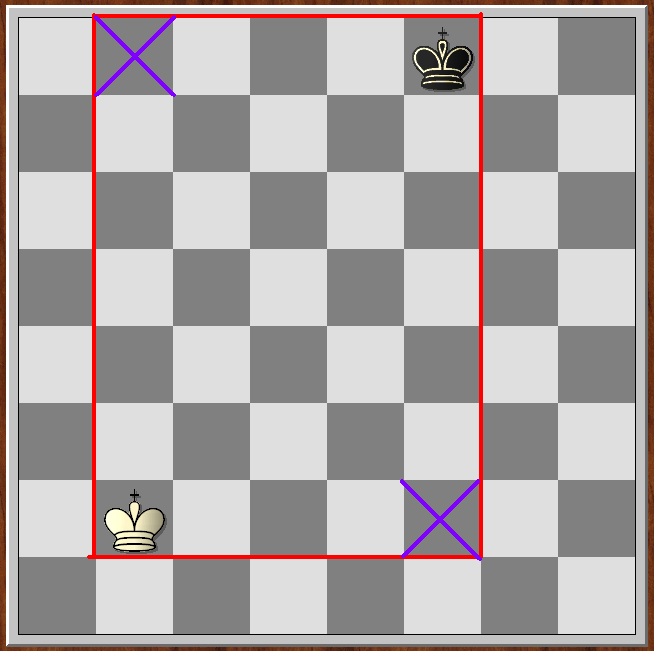 If all the adjacent squares are occupied by the king's own pieces or controlled by the opponent's, its escape is absolutely imposible. 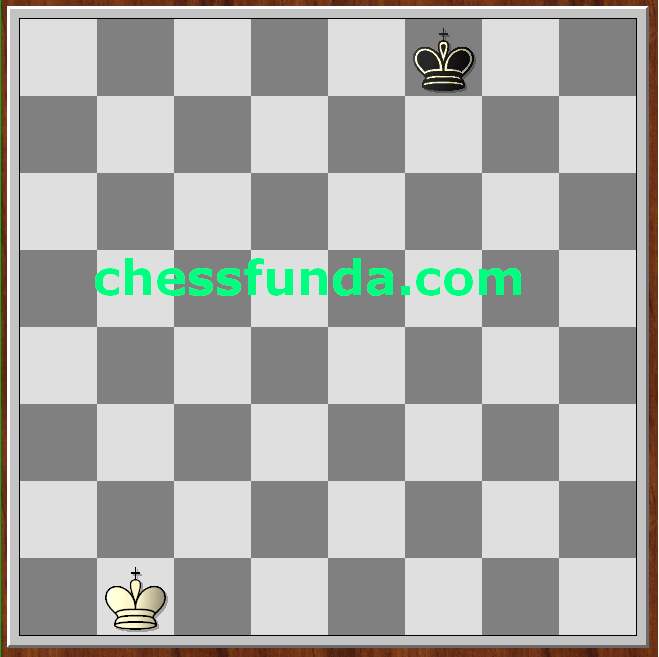 However, if the player is simply being prevented from castling, but other squares are not covered, the movement of the king is only relatively restricted; in other words, it can move at the cost of losing the right to castle. Castling can also be thwarted indirectly : for instance, if the king has to guard one of the pieces which is protecting it ( e.g. on e7 in Black's case). The second for an attack of this kind depends on the attacker's own circumstances. First of all, the e-file should be open, or it should at any rate by in the attacker's power to open it; the attacker should also either have a piece which can control a file ( a rook or queen ) on the file or be abble quickly to post one on it. Besides this, he usually needs to strengthen his pressure on the e-file, for instance by doubling rooks or by attacking one of his opponents pieces which is on the file and protecting the king. From these necessary conditions it transpires that in an attack along the e-file there tends to be a chain of defence, and the attack is carried out against the central unit of the chain, that is, the piece protecting the king. If this piece is on the square directly infront of the King ( e7 or e2), the attacker may be able to mate bycapturing it with hsi queen ( or Rook) i.e by making the square into the focal point. An attack on the e-file tends to occur most frequently at an early stage of the game. The following miniature is an example of how raipdly this kind of attack may develop after an openign mistake. Agood move, which counters White's Plan ( Be2 and 0-0 ) by attacking along the e-file. If white were now to play 8 e3, such an attack would admittedly not follow, but he would still be weakening his position. 8 Bg2 Ba6 9 Qd3 d5 10 b3 d4! An interesting move; Black abandons his attack on the e-file for the time being, transferring his pressure to the weakened diagonal 15-e1. If White now takes the c6 pawn and then the a8-rook, Black can win a piece by ---Bxc3+ and ---Bxa1. Forcing the queen to give up the defence of the kinght. 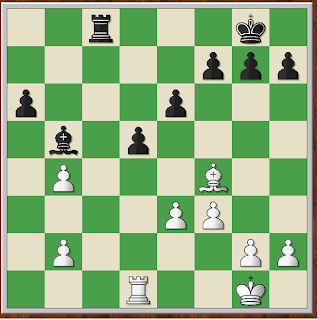 White regains, since 14 cxd5 is followed by 14---Qxe2#. Play returns to the e-file at the final point of victory. With an attack along the e-file, the main difficulty can often be the actualopening up of the file, especially if everything else has already been achieved. Dear Readers your comments are the most valuable assets for us. Lilienthal - Botvinnik, Moscow 1935. Black to Play. In the diagram You have say, Is the Black doing well or will the advantages in White's position lead to difficulties for the second player. pawns. 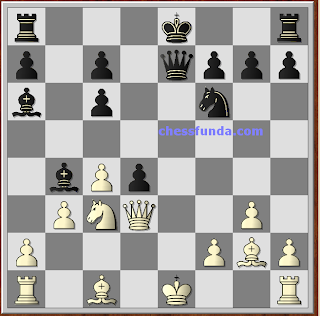 Black has no problem developing his forces and both his Knights are centrally placed. Probably the most important imbalances in this position, though, are Black's lead in development and the fact that White's King is still in the centre. If Black plays slowly with ---b6 and ---Bb7, White will catch up in development via Ne2 and 0-0 when the two Bishops may make themselves felt. It is clear that Black must do something quickly if he is to make use of the temporary imbalance of development. What are you to do if your opponent is behind in development and his King is uncastled? The answer is to open the position! Only in this way can your better developed army force its way into the enemy position. generally true, but clearly wrong and short-sighted in this case. the rule of opening things up for one's better developed pieces takes precedence, since by acting quickly Black keeps White off balance and actualy prevents White from using the pluses in his position. The alternatives are also unpalatable. 3 e4 Nf4 4 Bxf4 exf4 5 d5 Qh4+ 6 Kf1 Ne5 When white no longer has the two bishops and Black has a great support point on e5. Even worse is 3 Ne2 exd4 4 exd4 Nxd4! 5 Nxd4 Qh4+ 6 g3 Qxd4 and Black has won a pawn. 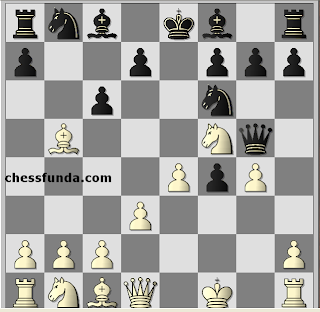 This combination was possible due to White's hnging Knight on d4 and his exposed King on e1. Euwe says that 4--- Nf6! would have given Black an edge. and the game was eventually drawn. It is clear now that Black had at least equality in the starting diagram, and that a lead in development can prove to be quite potent if acted upon energetically. A grandmaster pays attention to every slight detail and tries not to miss the slightest nuance, the least factor which might affect the assessment. 3) The constant possibility of advancing the pawn to d7. 4) Control over c7 and e7, combined with the attempt to control the e-file or c-file. 1) The chance to surround the d6 pawn from three sides. 2) The attack on the Q-side by a majority of pawns. 3) The possibility Nh5 to drive the queen from her storng post. By comparing and weighing the chances for each side the masters normally reach more or less objective conclusions which are called the assessment of the position. Bronstein criticized as not corresponding to the demands of the position. He recommends instead 22 b3 to put brake on the advance of the Queen side pawns, or 22 Rxe6 fe 23 Qe5 with active play against Black's many weaknesses that would be full compensation for the exchange. After 22 ---Re8 23 Ne4 Nxe4 24 Rxe4 Qd7 25 Qc5 Rd8 26 Qxe5 Rxd6 the players agreed to draw. Pin It If we dig through the History starting with the golden age before Morphy and Steinitz, when men were men and their only object in playing chess was to win as beautifully as possible. Both games have remained justly famous until the present day, so it is rare to find a chess-player who is not familiar with them. Nonetheless, letus look at them. Nonetheless, let us look at them briefly. 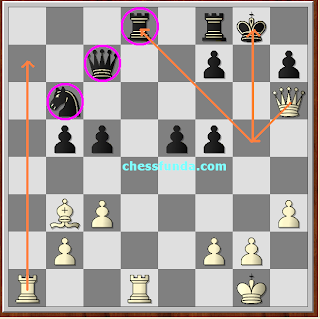 The diagram below is from the 'Immortal Game'. Anderssen targets the black queen, and is willing to leave his bishop en prise in order to gain the time to go after it . The threat is the lethal 12 Bxf4, so Black must either give back the piece or retreat the Knight to its starting square. He chooses the latter. Black has ony his queen in play. 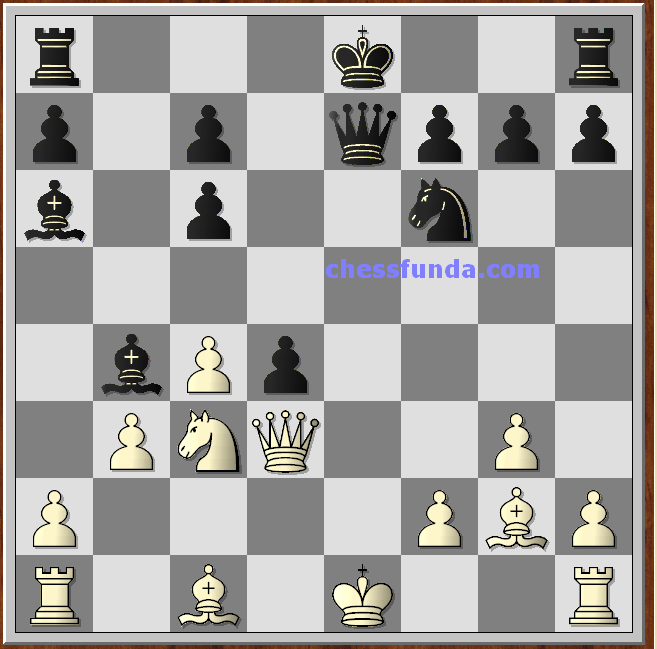 Meanwhile, Anderssen can develop his knight to c3, with the intention of playing it to d5 with gain of time. It is quite likely that Anderssen's keen analytical vision saw this possibility when he played 22 Rg1, and that the double rook sacrifice that follows figuered in his thoughts even then. Apparently, this is the crucial position for assessing Anderssen's idea. 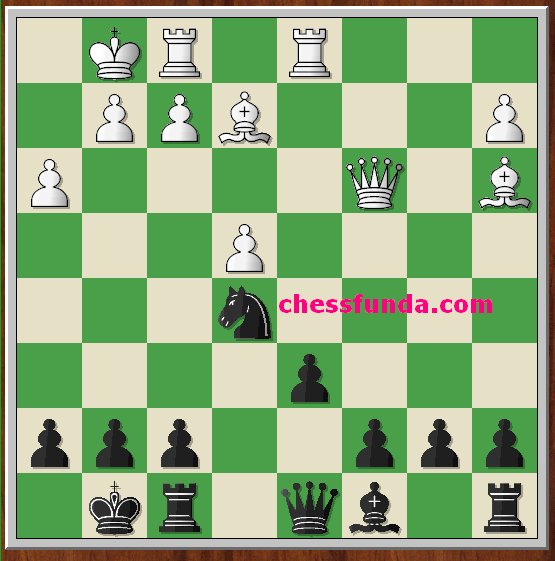 There are many other ways for Black to play, and all of them have since been proven to fail. The mov played by Kieseritzky looks very reasonable. Anderssen proves that it can, however, and in a way that makes the game truly immortal. He will throw in his queen as well. 17 Nf6+ gxf6 18 exf6 Rg8! Unfortunately, the sacrifice has also opened the g-file for Black and that, combined with the bishop on the long diagonal and the queen on h5, could spell trouble for White on f3 and g2. Anderssen must hurry to finish the game or risk being mated himself. That is just the recipe for abject failure or dramatic beauty. Anderssen leaves the kinght en prise betcause he has sen a magnificent mating finish. Understandably not seeing what is to come. Dufresne eats a hearty meal. Anderssen already two pieces behing, now throws in a rook and his queen to force a beautiful two bishop mate. Every move must be a check as Black threatens his own immediate mate. Over the following century and a half, these two games were scrutinized by many analytical talents and were found to be less than perfect. In the Kieseritzky game, most of the moves in the opening were deemed to be weak. We can accept that. We are wel aware that modern opening play is far more sophisticated than it was way back then. However, even the later play seems to have been a catalogue of errors. Pin It The dog has a natural attraction to the Bone so the Rooks have to the seventh rank. Once on the seventh rank, a Rook usually attacks many pawn and often traps the enemy King on the back rank. The above diagram shows what may look like an equal position to the untrained eye. However, White actually has a won game because his can dominate the seventh rank. simply intending Kb5 followed by Kc6. to prevent Kb5. 3 ---c6 hangs the a7 pawn. Ideas like 3---g5 4 Kb5 Ke8 lose to either 5 Kc6 or 5 Rh7. 4 Kd5 c5 5 Rd6 Rb8 6 Kc6 and Black must lose material. Loss of the game will follow. Some books claim that control of the seventh rank is worth as much as a pawn. In the absense of more important considertions, this makes perfect sense; the seventh rank makes your Rook better, and therefore more valuable, than the opponent's piece. White is a solid pawn ahead and has the move but the strong placement of the enemy Rook on the seventh makes a win impossible. Its important that Black make use of all his pieces. This keeps the Black Knight out of c4 and makes the b-pawn immune from the Black Rook. Getting the last queensie pawn off his second rank and preparing to open a file for his own Rook. 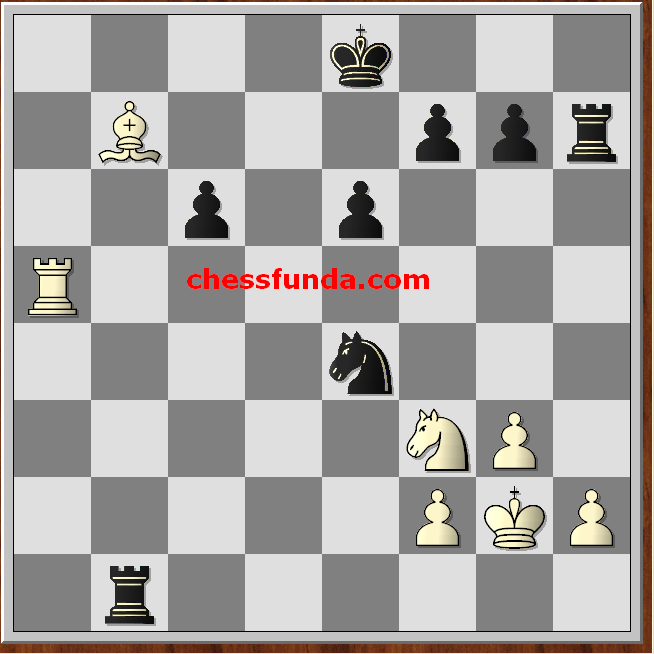 Making the White b-pawn imune from attack and fixing its oposite number on b5. It looks like White has made progress but the poor position of the White King gives Bllack enough counterplay to hold the game. 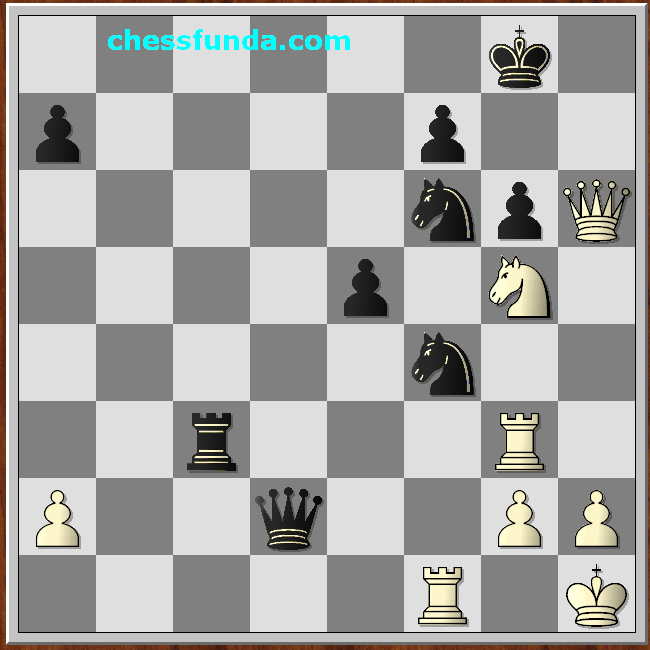 If White's Rook passively stays on the first rank then he wilno be able to achieve anything. If it journeys down the a-file for and adventure then Black will get a check on the back rank. White decieds to allow an immediate draw. Though the seventh rank is the ultimate goal of every Rook due to it's ability to attack pawns and the downthe enemy King, the sixth rank also has its virtues. 3) It is always ready to Jump to the seventh. Pin It "The aim of all maneuvers on an open files is the ultimate intrusion along this file onto the seventh or eight rank, i.e. into the enemy position"
Rooks need open files if they are to become a force in the game. However, if the open files does not fit in with the overall strategic plan, then it is not at all clear if you should play to control it - each position has its own answer. In particular, putting one's Rooks on a file often just leads to the opponent doing the same, and a subsequent massive trade down this file would then be a typical result. Of course, thrdes are not to be spurned, especially if you have prevented the opponent from dominating a file that could lead to an eventual unpleasantpenetration. Before you decide to fight for a file or simply give it to the opponent, yu should answer the following questions. 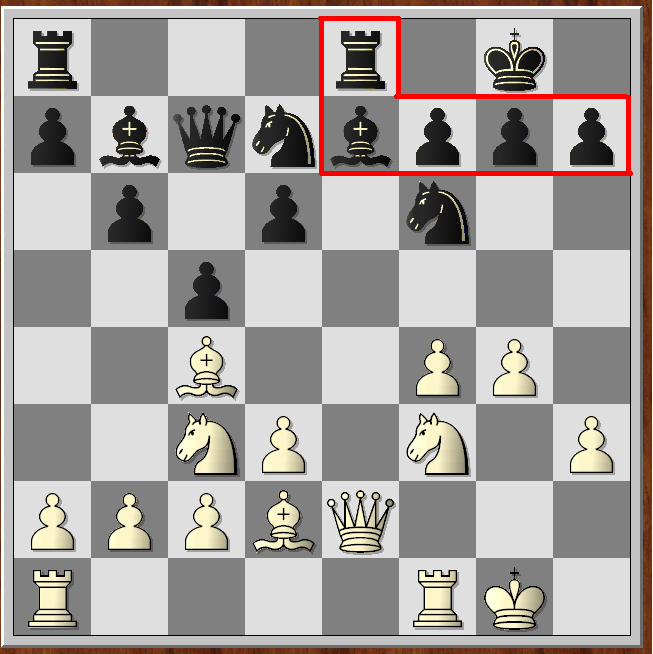 1) Is a penetration along this file possible for my opponent or myself? If it turns out to be a dead end street then why bother with it in the first place. 2) Can I afford to take the time to place my Rooks on this file or do I have more urgent business to attend to elsewhere? 3) If I place my Rooks on this file will they work with the rest of my pieces and influence the imbalances in the position? 4) Do certain factors in the position call for me to retain at least one Rook? If so, I might want to avoid the file (and a possible exchange along it) altoghthe. framed. These rules are to be observed in particular situations. I will not call these a rules because rules are to be followed in toto. I would like to call it as Guidelines to act in particular situation. We will see a game and try to reach the guidelines which will be helpful in the different complicated situations or framing combinations that lead to winning status. 1) The Black Queen is undefended. 2) Black's b6 knight and d8-Rook are not well defended because if the Queen at c7 is deflected the Knight can be captured. 1) The Black King is very open and unsafe. 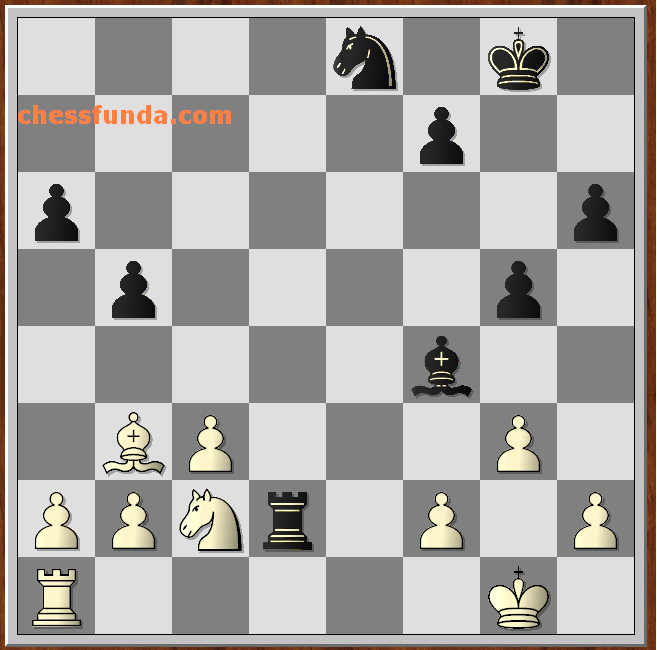 2) White can play Qc7+ and alternatively attacks Rd8. 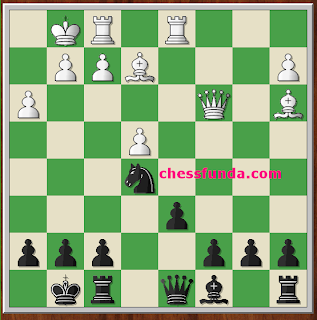 Which increases the attacking pieces of white on d8-Rook. After observing these things we can decide a strategy and combination thereof. It is that we should try to deflect the Black Queen or d8-Rook. Observing the pattern we can design different types of combinations. Then we have to see which is most advantages and apply. 1 Rxd8 Rxd8 2 Ra7 you will find what an excellent move? succeeded in deflecting the queen. 2 ... Qxa7 3 Qg5+ Kf8 4 Qxd8+ Kg7 You have done nothing but a forced trade that too in a style. 1 ---Kh8 but 2 Qf6 checkmate. 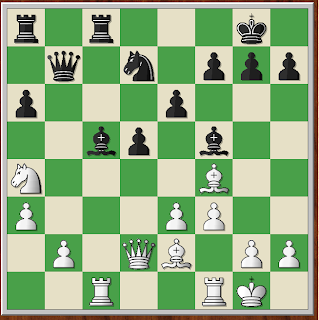 3 ---Rxf7 2 Qg5+ and the d8-Rook falls. 1 ---Qxf4 2 Rxd8! Black could now resign since 2 ... Rxd8 loses to something that looks remarkably like a triple jump in checkers : 3 Qxd8+ and 5 Qxb6. 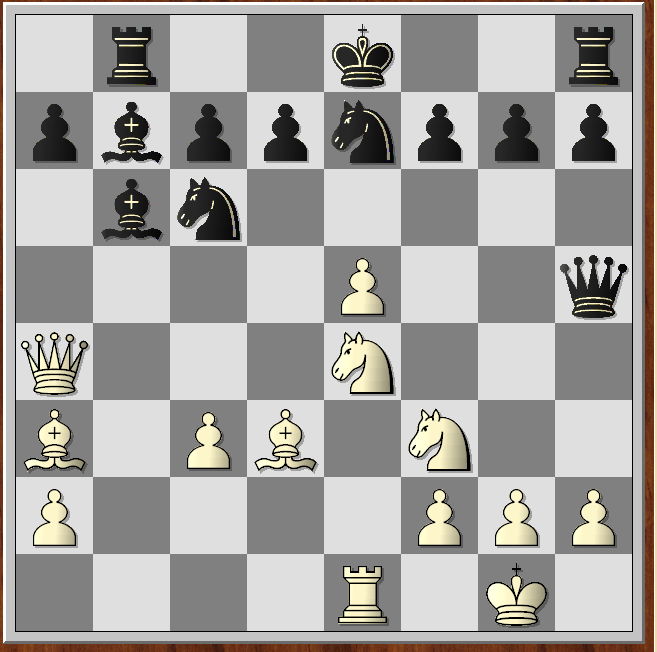 2--Na4 Any other Knight move allowed 3Raa8. Now 3 Rad1 followed by 4 R1d7 is quite crushing bu Alekhine, known as the sadist of the chess board, instead tortured his opponent with a 'quiet' move. 3 b3! and Black resigned 3---Nb6 hangs the knight to 4 Qxb6. 3 ---Nxc3 4 Raa8 leads to mate 3 ---Rxd8 4. Qg5+ wins back the Rook with check and then allows White to chop off the Knight with axb3. 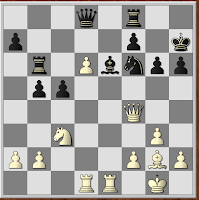 3 ---Qxb3 4 Rxf8 mate. To add one more thought to the subject of combinations, GM Y. Averbach has stated that the vast majority of combinations are based in one way or another on the theme of double attack. 1) Open or Weakened King. 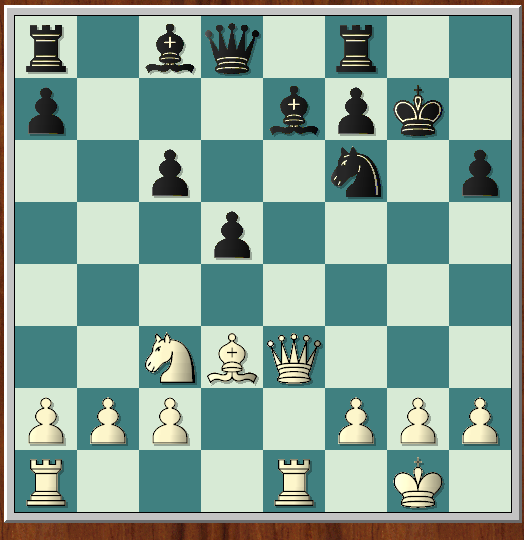 Also includes stalemated King. always follow these guidelines to reach any combination which is most advantageous. 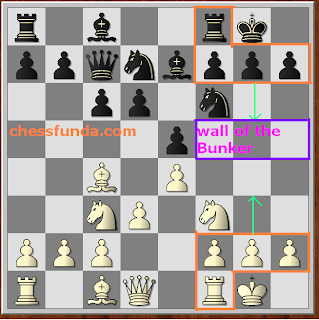 enters into the bunker where the safety of the King is more during the time of actual game. The three pawns and a Rook covers the King and hence it is difficult for the opponent to destroy this Bunker. To destroy this Bunker the opponent will often have to sacrifice his one or two commandos and draw out the enemy King out of its Bunker to the fighting ground. When this king comes out on the battle ground without cover it can be attacked very easily and perished. Here see the example How white has used the chess tactics / chess strategies to take out the King on the battle field. In the above diagram White to Play and First see the common mistake made by the White in taking out the enemy King out of the Bunker. Remember it is not sufficient to take out the king only to the second rank (Sometimes it suffice) but sometimes it is necessary to draw out the king still further otherwise the king may step back to its original position, the position of safety. 1 Ng5 h6 2 Nxf7?! Rxf7 3 Bxf7+ Kxf7. This is not the good maneuver for White. Black's King can easily step back to safety with 4 ... Kg8. 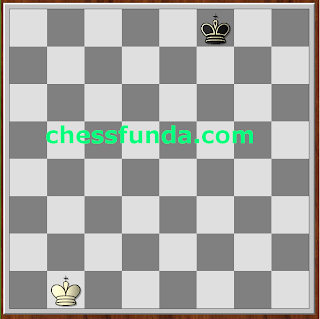 If you want to be successful with a capture on f7, you must draw the King even further into the centre of the board. The following example illustrates it best. Here White finds a novel way of inviting Black's King to come to the Battle field. Bishop knocked at the door of the castle / Bunker and the Black King opened the door to see the one who is waiting at the door with the intention to attack the Knocker. He succeeds in doing so and this is the first sacrifice of the White in drawing out the enemy King. If this King succeeds in occupying the original position then with .... Kg8, then While's sacrifice will have been in vain. It should be the part of tactics / strategy to pull him out further by the another piece hiding just near by ( I call this piece as waiting piece). Oh! White is still ready to sacrifice his Queen. Now Black retreats with 2 Kf8 loses o 3 Ng5 and Qf7 Checkmate is hard to stop. 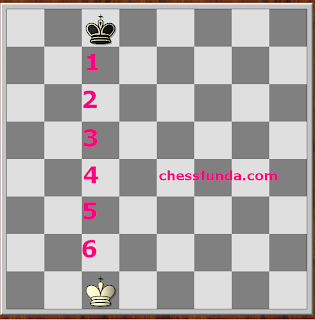 Therefore, Black decides to capture the Queen as a Gift came on the way and steps into the middle of the board. The response is 3 Ng5 checkmate. Always try to keep the pawn cover in front of your King intact and be sure your King has room to breathe otherwise you will be the victim of back rank checkmate. Dear Readers If you have such examples in your database please contribute it through comments since your comments are the most valuable assets for us. era, and defensive technique had become more important. Positional concepts, rather than exclusively combinational ideas, were the stock-in-trade of the masters of Spielmann's day. Crazed, attacking players were looked upon as relics from an earlier, more primitive time. A lover of gambit openings, Spielmann played many swashbuckling games but never felt that he had reached his full potential. Finally, in the late 1920, Spielmann undertook a thorough study of positional concepts and endgames. The resulting change of style propelled him into the ranks of the world's top ten players. Reuben Fine once wrote that Spielmann's main concern in life, apart from chess, was to accumulate enough money to buy limitless quantities of beer! Always proud of his attacking prowess, Spielmann once lamented, "I can see combinations as well as Alekhine, but I cannot get to the positions where they are possible!" This innocent litle statement is actually quite revealing and illustrates the changes the game was undergoing at the time. Of course, you could still sacrifice pieces and atac, but to successful against the strongest players, you had to master all phases of the game. The time of the one-punch knock-out artist was quickly coming to an end. However, we can still enjoy replaying some haymaker chess games. Let's look at a beautiful example from the young Spielmann. His beloved beer must have tasted good after this one. Readers are requested to write comments if they have more information about Rudolf Spielmann. Readers comments are the most valuable assets. Pin It The Chess Windmill. The Windmill, an extremely potent but rare tactic, consists of a discovered check, followed by a normal check, followed by a discovered check, and so forth. It ends only when the attacker gets what he wants out of the situation. In the diagram above White is ready to win if he uses the windmill tactic. Black will get paralysed If White uses a mixture of checks, discovered checks, and captures. A demon of Windmill is ready to swallow the Black and Black has nothing to do in defence. The Bishop behind the Rook automatically checks the White King is called Discovered check. The King is again forced to occupy the same place of discovered-check position. Black is left only with King! Dear Readers If you have such example in your detabase please write it in comment box because readers comments are assets to us. Pin It Daily Chess Puzzle 31. At first glance, this position looks completely hopeless for White because he can't prevent Black from corwning his h2-pawn with check. However, White has only one pawn that can move, so he plays for stalemate with 1 h7+ Kh8 2 Bg7+ Kxh7 ( now white has no more pawn moves, but his King seems to have plenty of places to go) 3 Ba1+! ( excellent ) this move takes the a1- square away from the White King and simultaneously deprives the Bishop of any moves) 5 ... h1=Q ( forced because White threatens to stop the Promotion with Rc1; White now gets rid of his last mobile piece) 6 Rh8+! Kxh6 STalemate. wandering King will be quickly executed by a vindictive Queen and her cohorts.This matriarchy exists as long as the all-powerful Queens roam. Eventually though, all goes quiet; the warring factions have bludgeoned each other into oblivion and only the kings and a few faithful pawns are left ( a remaining Knight, Bishop, or Rook may also exist, acting as small dogs that bark and snap at the King's heels). When the board is finally cleared of hostile pieces the kings finally become supreme. Now, safe from attack from the extinct larger pieces, the Kings are free to leave their respective bunkers and go for a stroll. At times what's left of the two male run armies give up hostilities and make peace - a draw is declared. More often the not though, the King, so recently freed from the bullying presence of the dominating Queen, finds himself lonely. He misses his lay and goes in search of a new one. Thus the queening of a pawn becomes his sole ambition and he roams the face of the board in an effort to turn this dream into reality. Therefore, it is necessary to understand the basic movements of the King and the relation that the opposing Kings have to each other. The fight between Kings to determine which one is stronger is called the opposition. Both Kings would like to advance but they are placed in a way that prevents their counterpart from doing so. 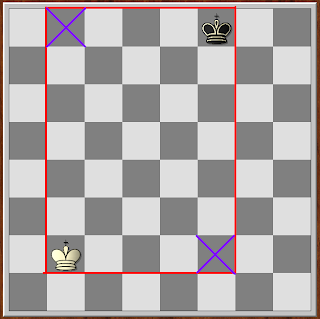 In this type of situation it is disadvantageous to have the move since you must then give up control of one of the critical 'X' squares and allow the enemy king to advance. With this in mind, we can see that White to move gives Black the opposition since 1 Kd3 allows 1 ... Kb4, ehilr 1Kb3 allows 1 ... Kd4. In both cases, Black's King is making headway into White's position. This is called the distant opposition, The rule is : Whoever is to move when there is an odd number of squares between the Kings does not have the opposition. ther reverse is : Whoever is to move when there is an even number of squares between the King does have the opposition. If they continue to walk towards each other we will arrive at diagram 1 again. These same rules also apply to diagonals. If it is White to move then who has the opposition? 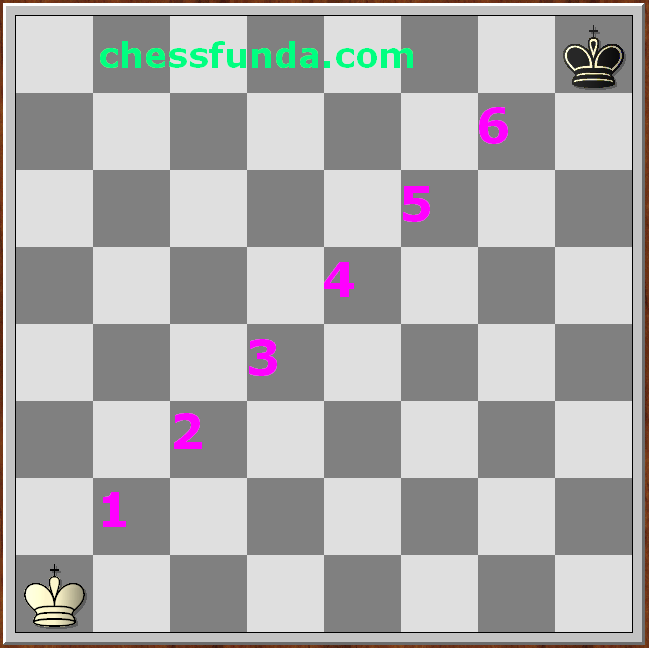 The answer is that white does since there is an even number of squares between the Kings. This White would play 1 Kb2 which would leave Black on the move with an odd number of squares between the KIngs. 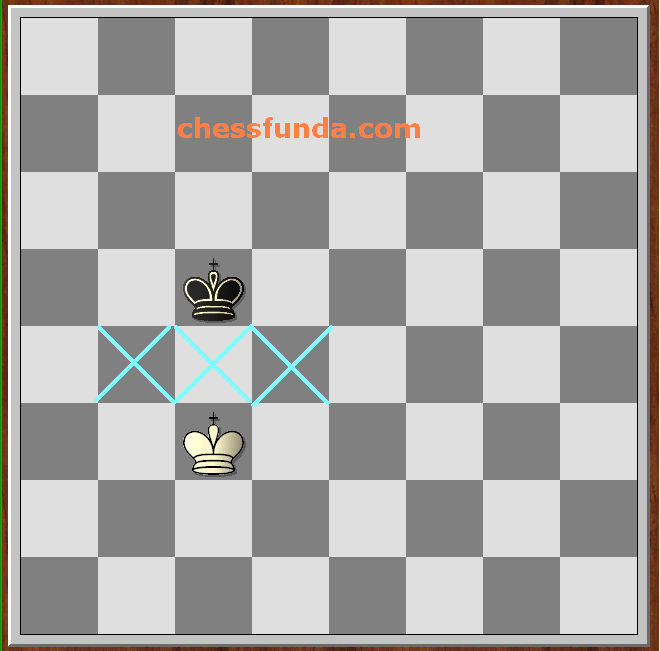 It now should not be difficult to determine who has the opposition when the Kings connect on a rank, file or diagonal. But what if they fail to connect altogether? Does one then need to work out difficult mathematical formulas? Hardly! Let us look at the following diagram. 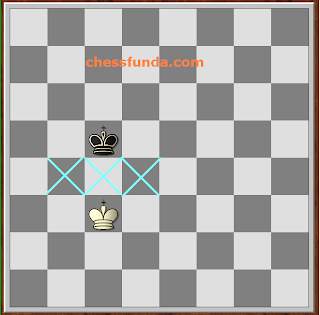 In nonconnecting situations the rule is : Move the King to a square or rectangel in which each corner is the same colour That is illustrated in the following diagram. Note that each time someone moves , a new series of connection points are formed. 2 Qf8+ Kh7 3 Ng5 checkmate. no ground in the centre, but he doesnot see any reason to block his light-squared bishop in with 2...e6. It's true that his queen's knight probably isn't too thrilled at seeing the c6 square taken away from it, but Black reckons that he usually needs the c-pawn to help in the centre one way or another in the Queen's Gambit, so he does not want to go ....Nc6 and block the pawn. a) 4... b5 is not highly recommended due to 5 a4 e6 6 axb5 cxb5 7 b3 Bb4+ ( 7 ... Nf8 bxc4 bxc4 9 Bxc4 will always be at least a little better for White with the a7 target, especially after 9 ...Be7 ?! 10 Ne5 followed by Qf3 ) 8 Bd2 Bxd2+ 9 Nbxd2 a5 10 bxc4 b4 11 Ne5 intending 11 ... Nf6 12 Qa4+ as White takes advantage of his lead in development at once, otherwise this "Abrahams-type position with a pair of pieces exchanged can easily turn in Black's favour. is very strong since 6 ... b6 7 e4 dxe4 8 Ne5 is just about winning for White, 6 ... Qb6 7 Nxd5 wins a pawn and 6 ... Bc8 While forced, clearly is not what Black was after. 4 ... Bg4? 5 Ne5 is obviously a mistake too, but meanwhile Black is a bit short of ways to aprepare the bishop development. giving up on the whole idea and playing 4 ... e6 is another entire opening complex called the semi-slav and is subject of the next chapter, while 4 ... g6 5 cxd5 cxd5 6 Bf4 is a little better for White the bishop doesn't belong on g7 in this structure for a number of reasons, chief among them that Black is bound to have to play ...e6 anyway at some stage and thus leave himself with a complex of weakened dark squares, and also he makes it harder for himself to play ...Bf5 since this piece will no longer be able to retreat along the b1 - h7 diagonal. In fact modern theory has unearthed the clever waiting move 4 ... a6, the Chebanenko System which keeps the dream of bishop development alive and is dealth with below, but 4 ... d x c4 is the historical main line of the Slav. Black is 'giving up' the centre in a sense, but in return he gets to develop his bishop ( and thus all his minor pieces) conveniently, and also extracts an important concession. And here it is. If White wants to retrieve his pawn convenienty he had to do this. After 5 e4 anothe point of --- c6 reveals itself as Black continues with 5 ... b5. this is a genuine gambit, White no longer has any way to recover the pawn by force, he can play this way but theory holds that Black's chances are as good as White's. 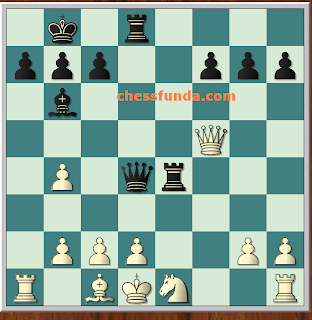 the text has always been the main line and White can now get his pawn back in peace, but he has lost a development tempo and also created a ghastly hole at b4. Slav endgames have a definite tendency to favour Black and really the whole reason for that is the structural damage White has had to do to himself to win his pawn back. After 5 a4 Black can develop the bishop comfortably and can retain control of e4 for a while with 5 ... Bf5 which we will consider before exploring the alternatives. 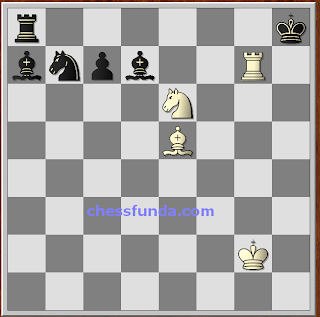 In the above diagram Black has a material advantage, but it proves to be short-lived. With 1 Bxc6 White creates a fork - a double atack on both the Black King and KNight. After 1 ... Ke7 2 Bxe4, Black thinks he has recovered satisfactorily because he is only down 1 point Two minor pieces ( 6 points ) vs. One rook ( 5 points ) But to his horror he notices that a new fork has been created! 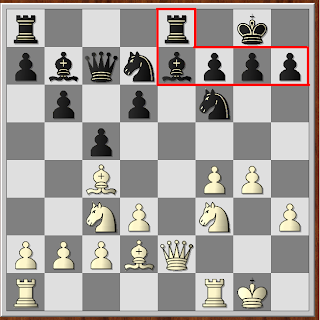 Now his Rooks on b1 and h7 are both under attack, and one must be lost. this second fork shows that a fork does not alwyas involve a chec : All pieces are vulnerable. The Rook Forks will be discussed in the next article.